Concerned about the accuracy and integrity of your measurements? Worried about meeting quality and/or regulatory mandated calibration and certification requirements? Is maintaining your investment of costly instrumentation a priority? 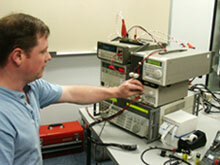 Whatever your Test & Measurement Equipment service needs, ACCULAB has a cost-effective solution! From complete calibration, certification and repair capability at our 6200-sq.ft. state-of-the-art laboratory, to the convenience of on-site calibration at your facility, ACCULAB can tailor a program to meet your individual requirements. For organizations that demand a more comprehensive approach to asset management we offer Total Metrology Management (TMM) – ACCULAB‘s turnkey solution to calibration system management. TMM will free you from the cumbersome, time consuming, and costly burdens associated with staffing and maintaining internal calibration capability. ACCULAB‘s fleet of specially equipped vans pick up and deliver equipment to industries and institutions throughout New England. We also receive and ship instruments nationally and internationally. As a value-added feature ACCULAB customers enjoy the benefit of immediate, “Real Time” access to their calibration system documents and records via our secure on-line database – Metrology X-Plorer. At ACCULAB, full service is more than a philosophy. It’s a promise!